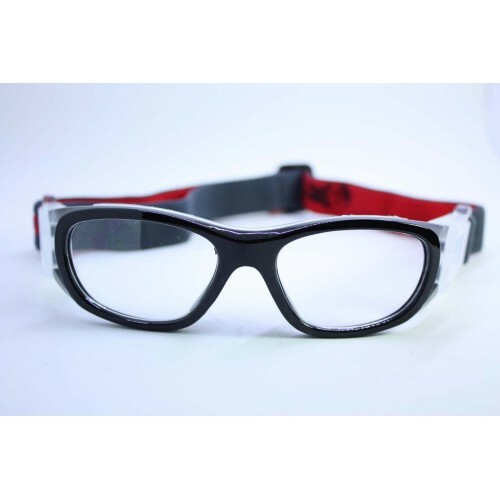 This Sport Goggle is used in outside ball game such as Basketball/football/tennis ball for the person with glasses. With it, you won't worry about glasses drop down. With plano lenses, so you can wear it protect your eyes from unexpected minor accident like hitting eyes by ball, very easy and convenient to use. It's the ideal goggle for basketball/football/tennis ball lovers.These glasses Standard with Plain Glass Spectacles, but you can replace it of your own prescription lenses. Very comfortable, works well to protect eyes from fast-moving objects. Good breathable and perspective, windproof, dustproof . Contemporary temple design with premium adjustable strap. With hook on the box, can link it freely to your bag.